Take in the stunning panoramic views of the Straight of Georgia and the snow-capped North Shore Mountains from our beautiful, rustic oceanfront cottage. Enjoy drinks and meals on the deck while you watch the spectacular sunsets and, after dark, the lights of Vancouver. Then wake up to gorgeous sunrises over the mountains or star gaze at night through the large skylight in the second floor master bedroom. Watch birds, deer, otters, seals and bald eagles while you sip your morning cup of coffee from the sandstone beach, the wrap-around deck, or one of the two main bedrooms. You might even see a pod of orcas passing by, or sea lions frolicking in the ocean right in front of the house. The Hot Tub is nestled into the natural landscape just off of the beach, overlooking the ocean. Savour the gorgeous night time views of the stars and the lights of Vancouver. In the summer, watch the sunrise and sunset. In the winter, listen to the sound of crashing waves on the beach as all of your cares melts away. The house is tastefully decorated and equipped with all the basics you may need. Both the Master bedroom and second bedroom overlook the ocean and mountains. The Master bedroom has a larger than king size bed and a large skylight for star-gazing at night. The second bedroom has a queen size bed. Each of the other two bedrooms have sleeping lofts and two twin beds. The property is just 10 minutes by car from the ferry. It's a nice walk down a country road or just minutes away from stores, restaurants, the golf club and the pub, by car or bike. It sits on about 7 private wooded acres and 300 feet of low bank, sandstone waterfront. There are extensive lawns for lounging or playing games as well as a large pond where you may see wood, harlequin, mallard or other ducks. In the cooler months, snuggle by the fire with a good book, enjoy our great selection of board games or our wonderful and diverse collection of DVD's. We fell in love with Galiano Island about 25 years ago, and have been both full-time residents and 'weekenders'. We currently live in Vancouver and hope to return to Galiano full time one day. 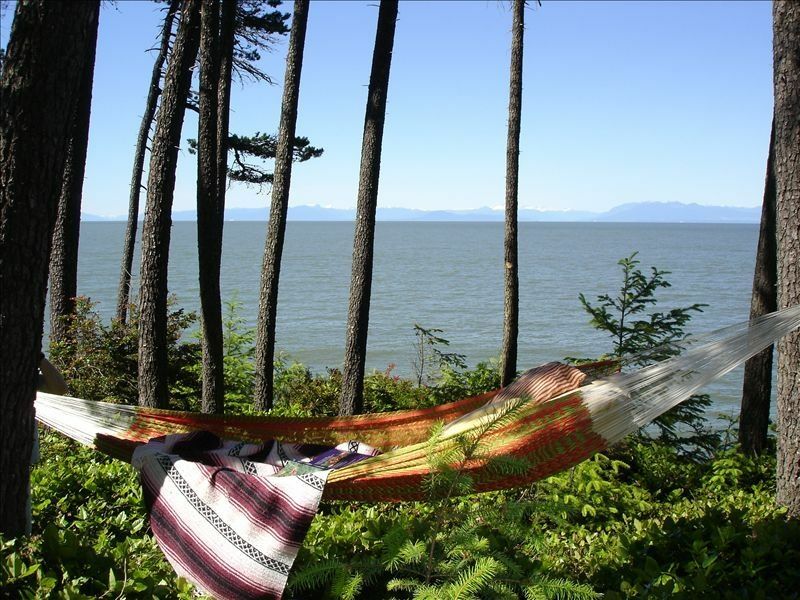 With it's Northern view of the Coast Mountains the property enjoys both beautiful sunrises and sunsets across the SAlish Sea in the summer months. We also have a charming outhouse. Open concept dining area with picture windows looking out on the garden and Salish Sea. Plays radio, CD's, and has a USB input. Board games or a rainy day. Nice selection of Jazz, Classical and World music. Mostly rugged, natural landscape, but large lawns as well. Wraparound deck with outdoor table seats 8-10 comfortably. Hot tub overlooks the Salish Sea and Coast Mountains. We loved our stay at Two Penguins! The master bedroom is dreamy - extra large bed with an incredible view. You feel like you are sleeping in a tree house on the beach, you fall asleep stargazing to the sound of the waves and wake up to eagles flying overhead. Loved the hot tub with the beach on one side and the yard with two little ponds on the other. We were just two people, but would happily come back with friends! It is remote, but a quick drive to a cute little market and corner store if you need anything. We arrived at night and the path string lights were on which was very helpful! Also liked that each room had its own controls for heat. Thanks so much for having us! Can’t wait to come back! So happy you enjoyed your stay Zoe. Thank you for your beautiful review. You are welcome back anytime. The property is immaculately kept, and well equipt. Great Kitchen with everything to cook amazing meals. Best Hot tub ever ! with a great ocean view but still very private. Cabin has a rustic feel with all the luxuries and amenities needed to be very comfortable. Wood burning fireplace is a nice touch and keeps it nice and warm and the skylights in the bedroom give the feeling of sleeping outside. Lots of eagles and other birds on the property. Caretaker and owner were very accommodating and went above and beyond to make our stay a reality during an intense snowstorm. They checked in on us via txt and made sure we had what we needed. Great experience, will certainly be back. So glad you enjoyed your stay Evan, and happy to have you back whenever the stars, (and weather), align. Our group has traveled to the Keats Island for the last 15 years on MLK weekend. Galiano was a wonderful place to continue our island tradition. We settled into island time exploring the island, artist galleries, hiking up Bodega Ridge in full sun to see the surrounding islands and to top it off, a Super Blood Wolf Moon eclipse. What a weekend. Thanks for sharing Two Penguins. It is a special place!! Absolutely loved it! Peaceful setting away from the city. Listening to the waves crash as we slept was heaven. The cabin is amazing inside and has everything you need. This was exactly what we were looking for in our vacation. Breathtaking views, oceanfront, quiet, peaceful and very relaxing. The cabin was perfect for what we needed and coming and going was so easy! Magical.Awesome. A beautiful, beautiful spot. The perfect cabin. Amazing views. Everything you need. My 7 year old and I stayed here for 3 nights. It was delightful. We went in the hot tub twice a day! We made a fire in the stove, read, played board games, watched movies, went for little walks. We went to the bookstore, got ice cream, went to the Bluffs and drove around and found cool spots by the ocean to explore. This place is a treasure. The views are stunning. One of my favorite parts was laying in the master bedroom bed at night and staring up at the stars! It was a big expansive place for the two of us, which we loved. AND it would comfortably fit a lot more people! It is spacious, it is well kept and fully stocked. I was well taken care of with a quick response when I had a question about how to operate the hot tub and the stove. A wonderful cabin experience. Can't wait to go back!!!! Saturday Farmer's market in the summer, various concerts, theatre and art shows at the community hall throughout the year, Annual Literary Festival and Wine Festival, Canada Day Jamboree, BC Day Lion's Fiesta and various other festivals throughout the year. *** WINTER SPECIAL *** 3rd night free Nov-Feb, (except long wknds & Christmas) 4th night free on long weekends Nov-Feb Minimum stay of 3 nights on long weekends. *Summer rentals are weekly only, Sunday - Sunday Rental fee is for up to 4 guests. Additional guests are $100 for adults and $50 for children.